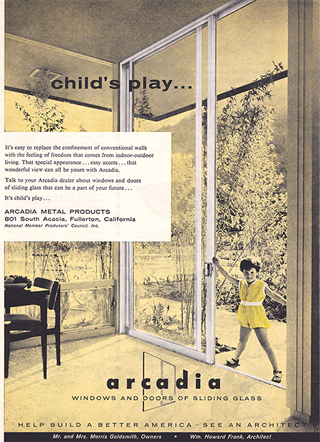 MCM got into the Sunset ads too, this one a full-pager by Arcadia, Eichler sliding-glass door manufacturer. 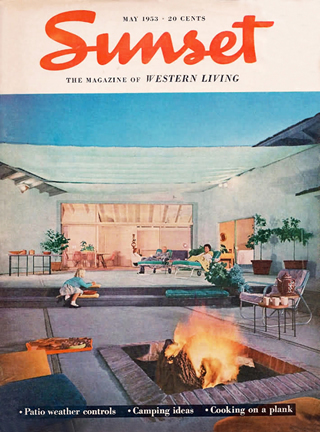 Two covers by Ernie Braun: one from October 1957 (top), another from May 1953 (above) showing how decks could be enjoyed year-round with a fire pit and radiant-heated slab. Naturally, Sunset had solutions, high among them privacy fences, with the goal of creating unbroken living spaces incorporating both indoor and outdoor rooms. "We no longer have to think only of building a house, and then raising a garden around it..." Sunset wrote. "We can design a garden and then build a house within it." For control of light and heat—persistent topics for Sunset articles—the magazine pushed balancing light by bringing it in from multiple directions, the use of tall clerestory windows, canvas and bamboo shades, and, especially, orientation to the sun. Sunset didn't write about architects—or even architecture as an art form or a discipline. It wrote about houses for people to live in. Some architects complained that Sunset often would not focus on the whole house, just on a feature Sunset appreciated—a deck, the arrangement of windows for light, etc.—Lane said in the oral history. The magazine urged readers not to pay attention to architectural styles, and preferred architects who focused not on their own styles but on the needs of their clients. "The Western idea is to be yourself," Sunset told readers in April 1952 "…Your own interests are more important than any ‘Style.'" And the magazine rarely played up the name of the architect behind whatever kitchen or deck they were showing. The reader often had to hunt to find who the designer was. The only time, between 1944 and 1972, a Frank Lloyd Wright house made the cover, his name was buried inside—and the focus was on canvas panels over the pool, not the house itself. Still, the magazine clearly had favorite designers whose work showed up year after year, sometimes decade after decade—landscape architects Tommy Church, Garret Eckbo, and Kathleen Imlay Stedman; and residential architects George Rockrise, Worley Wong, and Roger Lee. The modernism promoted in Sunset tended to be cozier than the steel-and-glass boxes often displayed in Arts & Architecture. Cover after cover showed modern interiors with wood walls and warm colors. Redwood and cedar, the magazine wrote in October 1945, "hold their own with ‘modern' materials. "Natural wood reflects a friendly, informal atmosphere very much in keeping with many of our ideas about Western living." 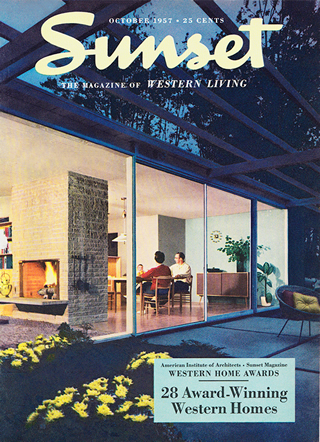 Still, steel houses did appear within its pages, especially after the mid-1950s when Sunset allied itself with the American Institute of Architects on a long series of Western Homes Awards, featuring winners in issue after issue. "Steel framing does not by itself determine the degree of a house's feeling of warmth," the magazine wrote in April 1959. "Such softening materials as fabrics inside and foliage outside can offset the austerity of a house that may otherwise appear simple to the point of severity." Within months Bethlehem Steel began running ads. "For contemporary homes," one bragged, "[architect Raphael] Soriano designs with steel." International Style architecture, much cooler than Sunset's general preference, appeared in the magazine's pages at other times too, including in a cover story about a sleek cubist design by architect Donald Olsen in October 1969.